Does your guided reading time fly by? Mine sure does! I only have twenty five minutes, twice a day. 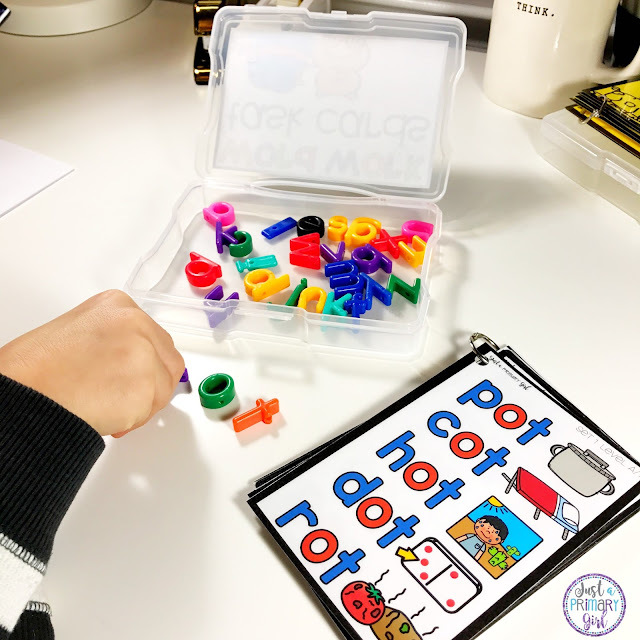 When I have my kiddos transition to their centers, and my others hop over to the guided reading table, I need to ensure everyone is working on activities that are appropriate for their independent levels. 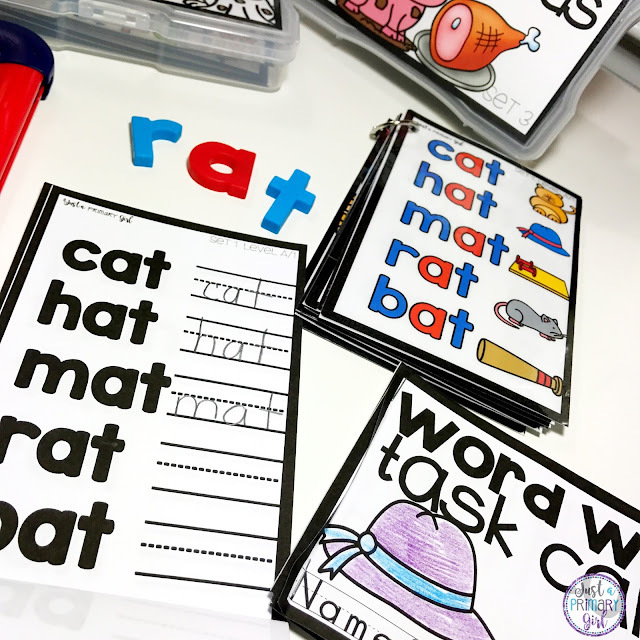 So today, I thought I would share one of the activities that I have students work on during centers times for my word work station. 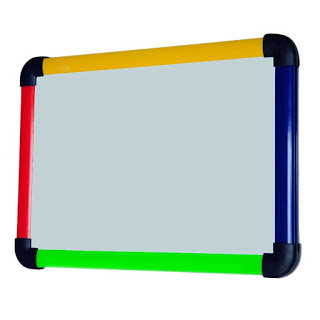 I use these magnetic boards in my classroom for EVERYTHING. 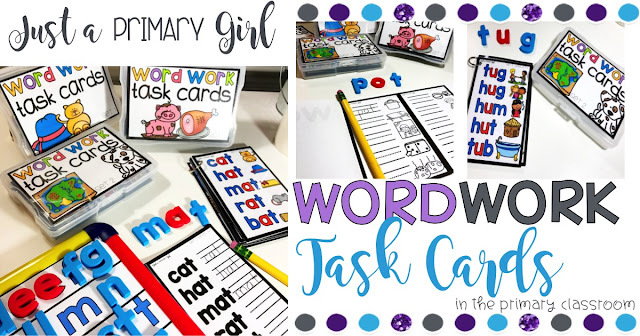 I use them in my guided reading groups, and for students that are in the work on words center. This new activity may end up becoming my favorite!!! 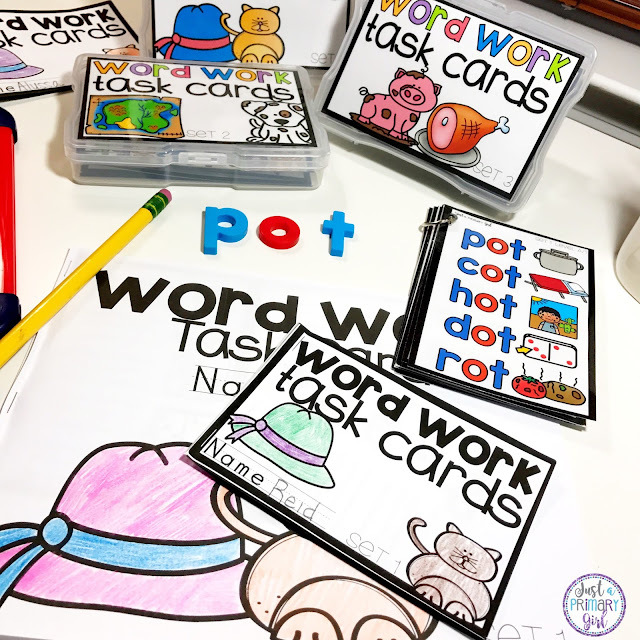 Word Work Task Cards start with level A-1 and go up through level C-3. Each card has five words. Set one starts with only substituting the ending sound. 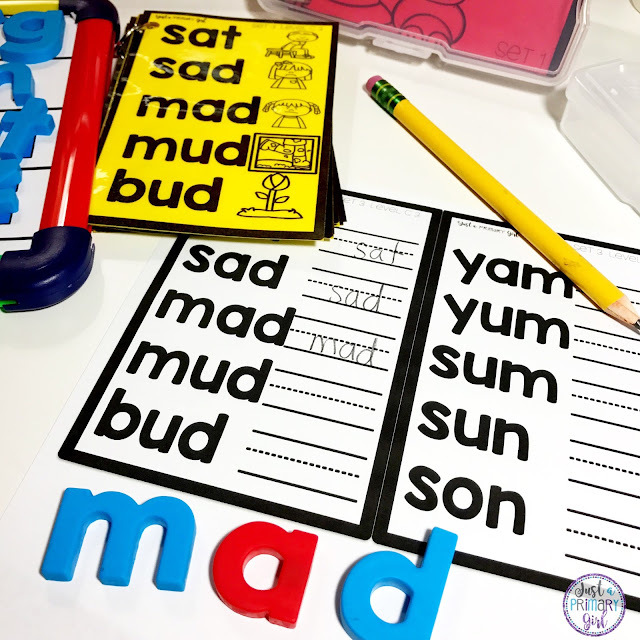 Set two substitutes either the first sound or ending sound, while each word only changes one letter at a time. Set three can substitute any sound in the word, still only changing one letter each line. 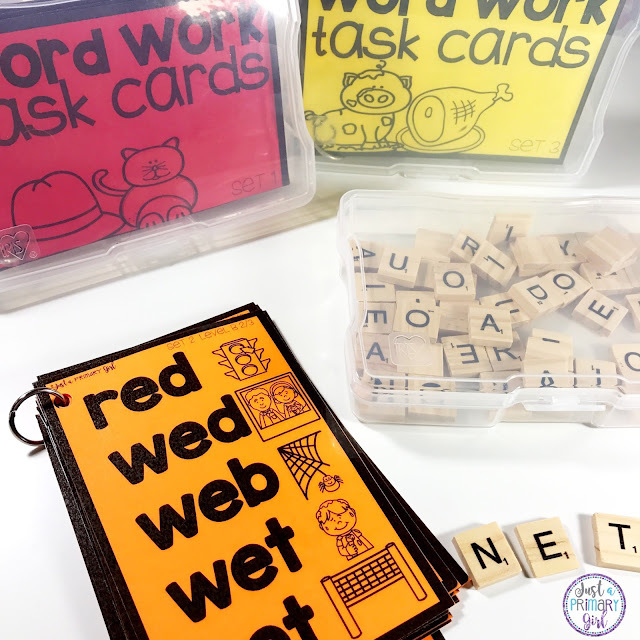 Each set has 45 words - with 135 cvc words in the entire pack! 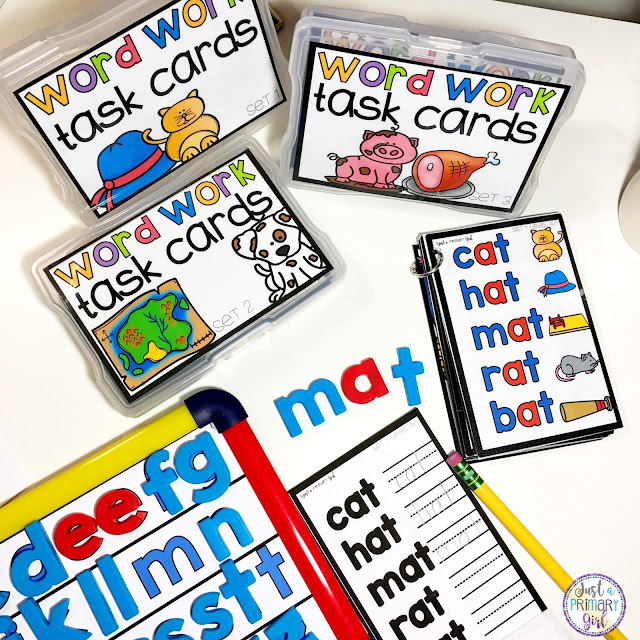 The task cards have two sized recording sheets if you want your students to have written reinforcement. One is a full size recording sheet that can be made into a booklet for easy storage. The small size is one that you can glue into word work journals. I will have my parent volunteers take these home and create my booklets so that I can keep them all together and glued into their notebooks! 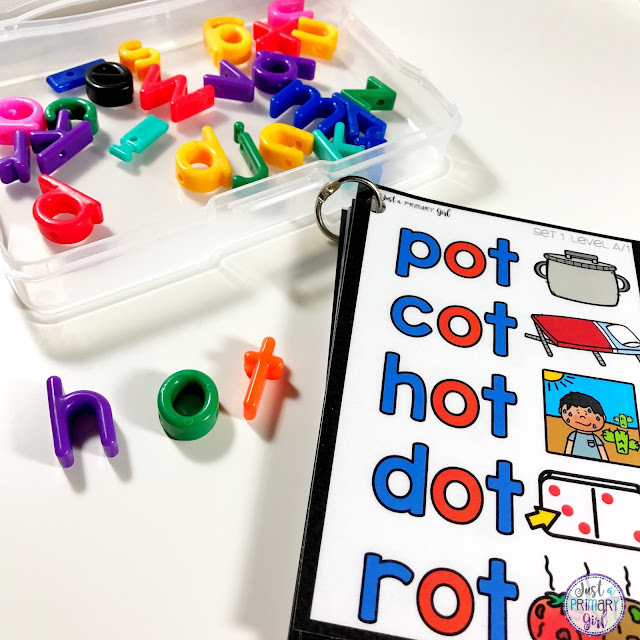 I have also included letters to use in case you don't have magnetic letters. These will fit easily into the task boxes. The boxes are called Iris Photo boxes. 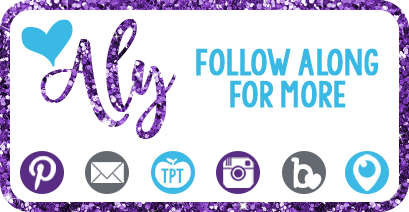 You can click the picture below to find the photo boxes that I use. I also have this set available in black and white to save you color ink. I will say that I think they really stand out in the astrobrights color paper. I would print each set starting with the color red. I keep everything in rainbow order. Set one is red. Set two is orange. Set three yellow. (coming soon will be set four green, set five blue, set six purple, set seven pink) I do this so that students know what set they are in and start at. Everything in my room goes with the rainbow. They know the order of the colors and know always to start with red and end with pink. The sets also have numbers on them so that students can double check where they are. 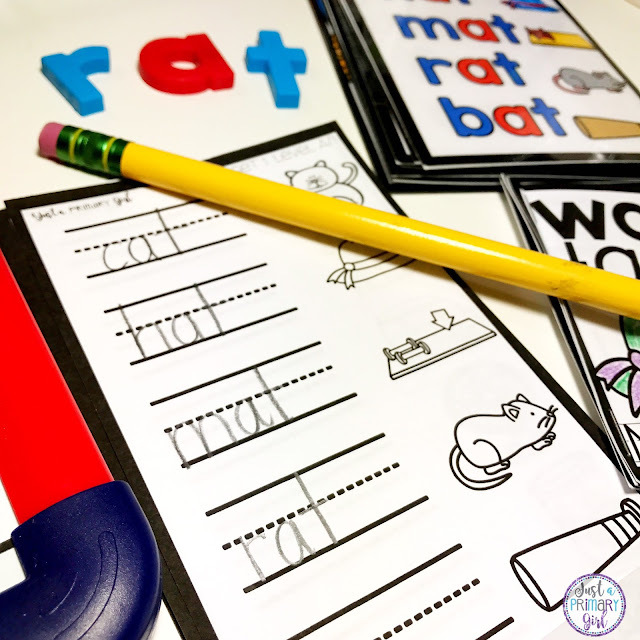 The recording sheets either have the words with a space to write after or the picture and the space next to it to record, depending on your child's ability level. I used the rings to keep my cards together. These small rings make it so that they fit easily into the task box containers. You can find the rings here. and skinny enough that you can use them inside the boxes as well. You can find the tiles by clicking here. 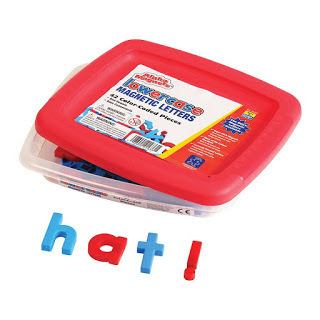 These letters are also easy to use and fit inside. I of course like them because they are so colorful. 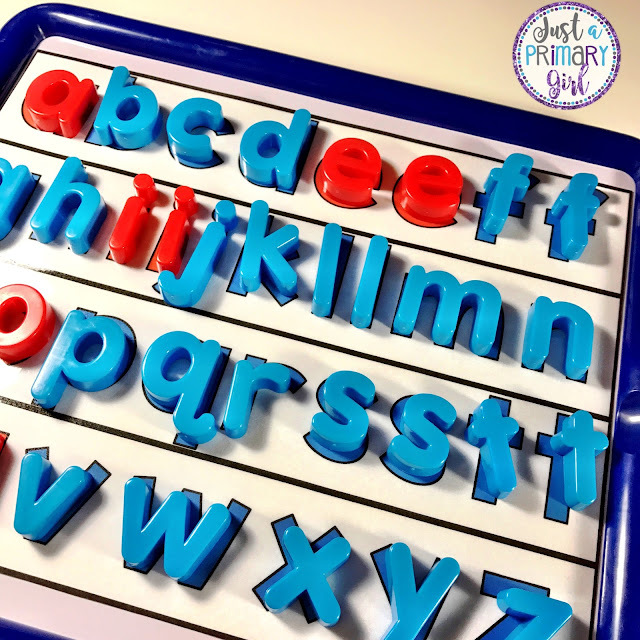 You can find these colorful letters by clicking here. It says that you can get at least 3 full sets a-z out of one bucket. I will find out and update this as I pull them into sets. 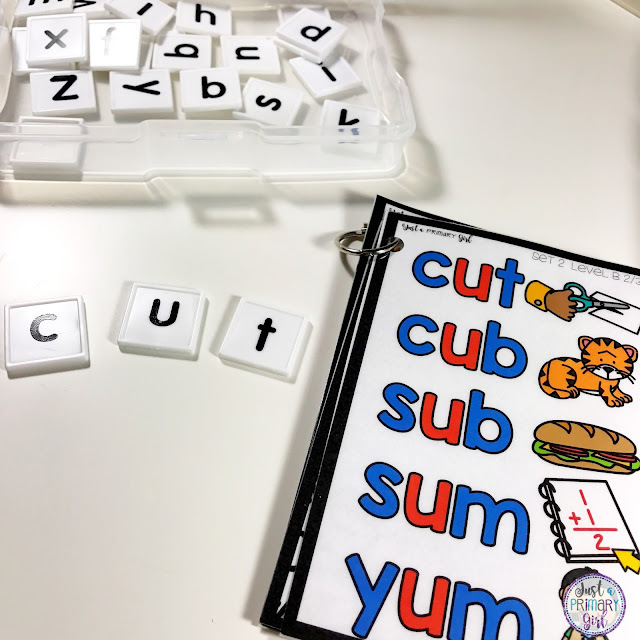 You can also use the banana gram or scrabble tiles for students to make these words. Click here for the link to the tiles. 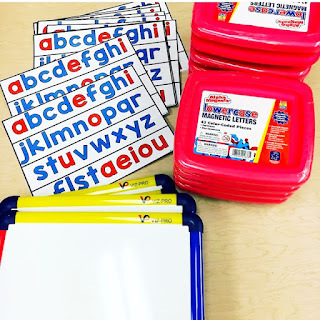 The great thing about this set is that it goes right along with Lucy Calkins Next Step in Guided Reading. So you know that if you are using this set, you are following right along with what you should be taught at each level. Here are the magnetic letters that I use. You can get a full board covered with five letters left over per box. So if you want five boards, you will need five of these sets of letters. Finally the template below that I place on top of the boards is scaled down to 87% so that it fits on these colorful boards. You can click the photo below to purchase the magnetic letter template. 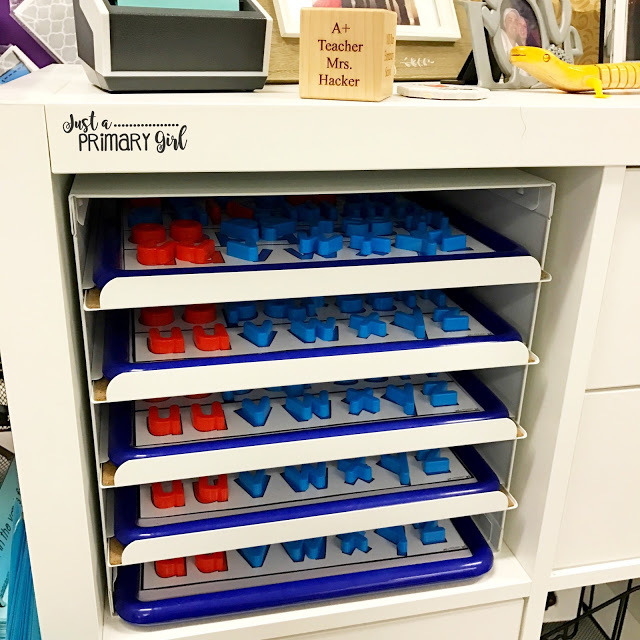 This allows students to EASILY return their letters and organize them. 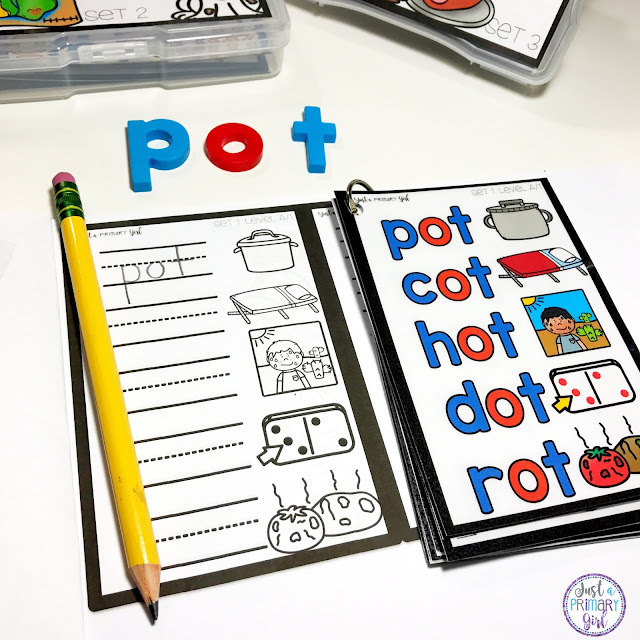 They will spend more time working on their activity and less time figuring out where their letters are. I hope you find this pack useful! 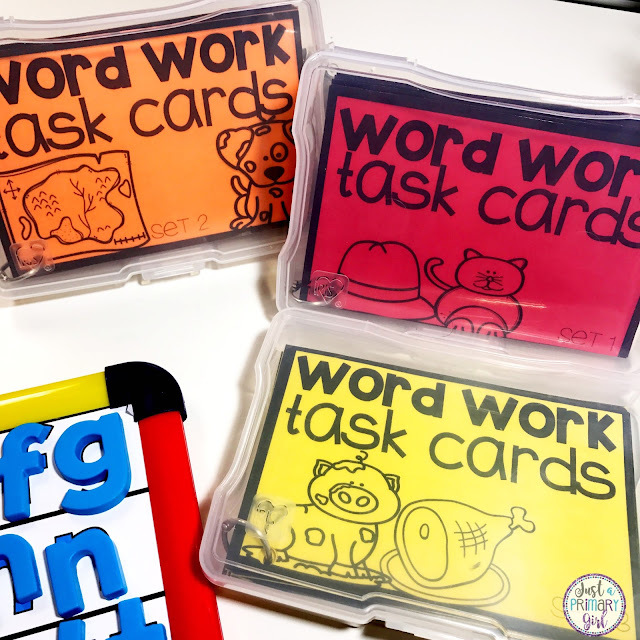 These word work task cards are PERFECT for an organized and efficient word work time. 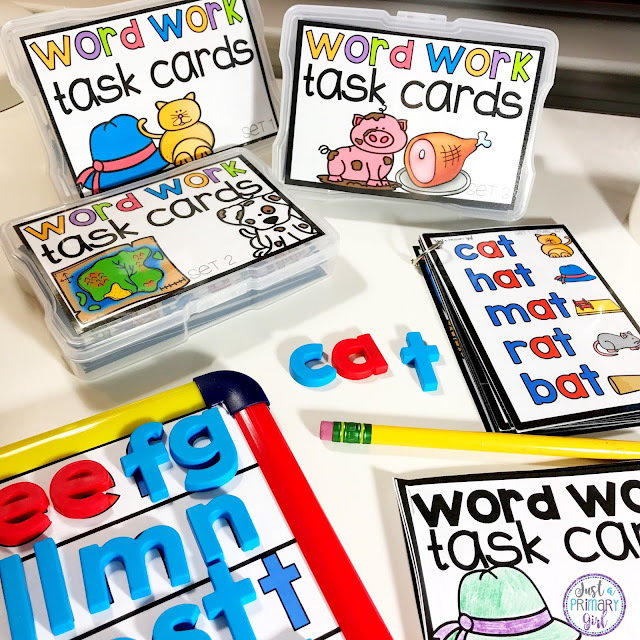 Click below to grab these task cards for your primary classroom. 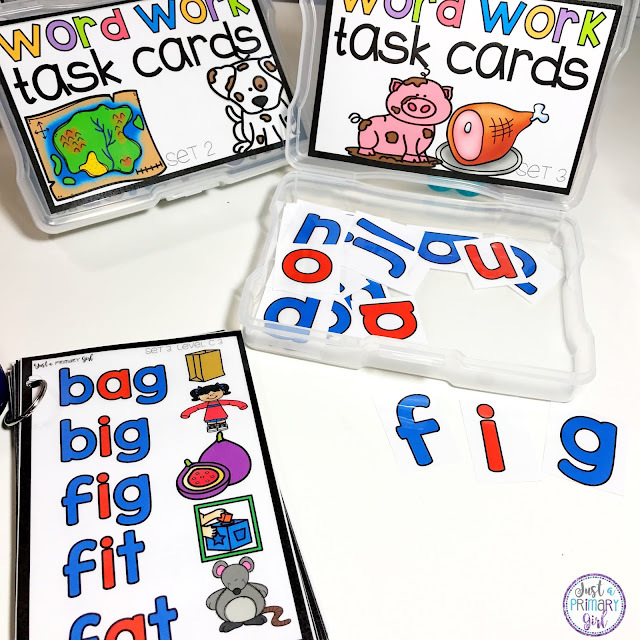 They would be a perfect addition to your pre-k, kindergarten, first grade, or sped classrooms! I love this!! I purchased it!!!! I was wondering when the other sets ( 4-7) will be complete? I am in the process of getting these ready for the upcoming school year. Thanks so much!